The Atlantic salmon, Salmo salar, is a fish in the family Salmonidae. 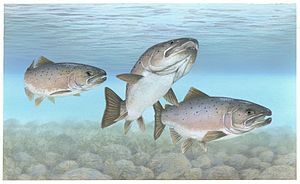 Atlantic salmon are found in the northern Atlantic Ocean and in rivers that flow into the north Atlantic. They have also been successfully transplanted into the north Pacific Ocean. Other names for Atlantic salmon are: bay salmon, black salmon, caplin-scull salmon, Sebago salmon, silver salmon, fiddler, or outside salmon. Atlantic salmon that don't journey to sea are known as landlocked salmon or ouananiche. This can be due to human interference or natural disasters. Most Atlantic salmon follow an anadromous life cycle. Once hatched, they are called alevins. They live off the nutrients in their yolk sac they were born with. Once they start feeding they are called fry. They grow into juveniles or parr and remain in fresh water for a number of years while growing. [a] When they leave fresh water they are called smolts. Smolts leave the streams and move into the ocean for feeding and growth. The post-smolts change from territorial behavior to that of open ocean, possibly shoaling, fish. Their mortality rate while in the ocean is very high. The rate is from 90% to as high as 99%. After 1–5 years at sea they return to spawn in the same streams they were born in. Unlike most Pacific varieties Atlantic salmon are iteroparous meaning they don't automatically die after their first spawning. But the stress of spawning, predators, exhaustion or disease does kill many. The remainder return to sea to spawn again and again. There is a variety in the life cycle of Atlantic salmon. They do not require salt water. Numerous examples of fully fresh water landlocked Atlantic salmon exist throughout the Northern Hemisphere. In North America, the landlocked fish are called ouananiche. Fresh water Atlantic salmon are smaller than the anadromous (ocean-dwelling) Atlantic salmon. ↑ Usually from 1–8 years but it varies. ↑ 2.0 2.1 2.2 The Audubon Society Field Guide to North American Fishes, Whales & Dolphins. Chanticleer Press. 1983. p. 395. This page was last changed on 9 July 2016, at 05:18.